Five teams are in the mix with 2-2 records at the midpoint of the season. If you’re trying to get a handle on the playoff race in the Pine Tree Conference Class B division, don’t bother. With five teams with 2-2 records at the midpoint of the season, the league’s playoff picture won’t be sorted out for a while. Right now, Brunswick (4-0) is the league’s only undefeated team and is in control of the top seed. At 3-1, Lawrence is in second place. Then there’s the big 2-2 jumble. As it stands right now, Mt. Blue and Messalonskee are tied for third, with Mt. Blue owning the head-to-head tiebreaker. Cony is fifth, Gardiner sixth, and Skowhegan seventh. • Messalonskee’s Jack Bernatchez ran for 215 yards and four touchdowns in a 40-21 win over Brewer. • MCI’s Eric Hathaway scored a pair of touchdowns in a 49-14 win over John Bapst. • Waterville’s Dan Pooler ran for 126 yards and three touchdowns in a 38-8 win over Nokomis. • Winslow’s Dylan Hapworth ran for two touchdowns and returned a punt for a score in a win over Camden Hills. Two of the 2-2 teams, Skowhegan and Cony, play each other this week. With so many teams evenly matched, playoff seeding could come down to Crabtree points, which means the crossover games against Western Class B teams are huge. For example, Messalonskee plays its crossover game this week against undefeated Marshwood. Last week, Mt. Blue played undefeated York. Win or lose, having those games on the schedule helps a team’s Crabtree points, which are calculated by adding your winning percentage with the winning percentage of all your opponents. The PTC B is arguably the most competitive league in the state, and the playoff picture likely will not be sorted out until the final week of the regular season, but that’s as it should be. It was the score that made every high school football fan in the state do a double take, or make a joke about basketball season starting early. Belfast 82, Madison 60. The combined 142 points is the highest scoring game in the state this season, by a long shot. It’s 40 points over its closest competition, the Orono-Mt. View game played on Sept. 12, won by Orono, 58-44. Madison, which scored 61 points in its first three games combined, almost doubled its point total for the season. Belfast gave up more points than it had allowed in its first three games combined. Belfast running back Steven Davis scored eight touchdowns, which is a very good season for many players. Madison has now played in two of the four highest scoring games of the year. 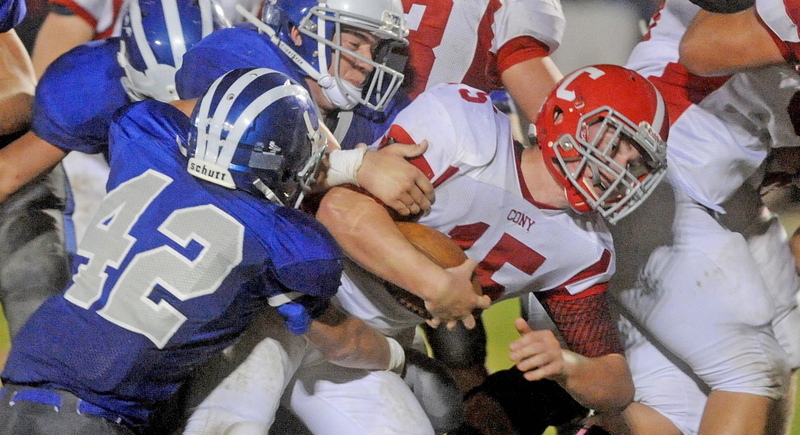 On Sept. 12, the Bulldogs beat Old Town, 46-42. That combined score of 88 points was matched this past weekend when Foxcroft beat Old Town, 55-33. Messalonskee is 2-2 at the midpoint of the season, and with just 17 upperclassmen on the roster, head coach Brad Bishop is pleased. “We’re just getting better, and we haven’t played that bad to begin with,” Bishop said. The Eagles have to be playing their best football now, because over the second half of the season, they’ll play the toughest schedule in the Pine Tree Conference. Messalonskee’s final four opponents — Marshwood, Brunswick, Hampden and Lawrence — are a combined 12-4. Marshwood and Brunswick, Messalonskee’s next two opponents, are each undefeated. Right now, Bishop is focused just on the Hawks. Maine Central Institute suffered a pair of injuries to its starting backfield in Friday night’s win over John Bapst. Jonathan Santiago and Eric Hathaway each left the 49-14 win with an apparent knee injury. Both players were scheduled to be evaluated on Monday, MCI head coach Tom Bertrand said. If either Santiago or Hathaway is hurt for an extended time, the Huskies (4-0) have depth in the backfield. Fullback Alex Bertrand could get more carries, along with sophomore Willie Moss, when MCI hosts Washington Academy on Friday. Around the state: At the midpoints of the season, the comeback of the year belongs to Bangor. Down 21-0 at Portland, Bangor rallied for a 28-27 overtime win… Windham’s 35-7 win at Cheverus snapped the Stags’ 36-game regular-season win streak. Cheverus had not lost a regular-season game since 2009… Speaking of Bangor and Windham, the two 4-0 teams meet Friday night at Bangor’s Cameron Stadium… Thornton Academy head coach Kevin Kezal earned his 100th career win on Friday, when the Trojans defeated Sanford, 48-7.